The more I learn about old-time Phoenix, the more I realize that the trees have been gone much longer than I had thought. Originally I kinda thought the 1980s, or the 1970s, but it looks like the end of Phoenix as a city of trees started much longer ago than that. Even the "old-timers" (wise and venerable ones if you prefer) that I know don't remember the way Phoenix once had trees. The best that they can do is remember the trees along the canals, and along the roads, and the orange groves. And some of them lived with trees, and have fond memories of climbing on them, going back to the 1950s, and even a few decades before that. But none of them are old enough to remember Phoenix before air conditioning, or swamp cooling. And that was the time that Phoenix was a forest of trees, not just here and there, but everywhere. In my imagination I try to picture what Phoenix was like when every house had several trees. Yeah, I like air conditioning, but before that the shade of trees is what people had, from the 1870s on. The trees weren't just along canals, roads, and farms, people lived with them. They were everywhere. Time-travel with me. Right after the Civil War ended, the Swilling Company dug a small canal and established a settlement, sometimes called Pumpkinville, but most often the Phoenix Settlement. It was along a canal that started on the north bank of the Salt River, across from where Tempe is now, and flowed northwest towards where Van Buren and 32nd Street is now. And they knew that all the land needed was water, that it was very fertile from thousands of years of flooding, and receding, water, just like the Fertile Crescent of the Nile. So they planted things, including trees. Well, can you blame them? It was hot, and they liked the shade as much as we do now! As the city grew, and new canals were created, water flowed freely all over the valley. And trees were a cheap way to cool down the places where people, and animals, lived. They were simply planted small, and grew big with water. It must have been amazing to see the sun-scorched land became an oasis of trees in just a few years. You could walk in neighborhoods and never be away from shade. All of the houses had trees (well, they didn't have air conditioning!). It just made sense. But with the invention of air cooling, in the 1920s, and the improvements of air conditioning, after the 1940s, the trees really went away. It took a while, and the old timers (wise and venerable ones) saw the end of them. By the time I got to Phoenix, in 1977, they were mostly gone, and nowadays many people wonder if you can actually grow trees in the Phoenix area. I like trees, and I'd love to see them return to the city I love. And not just in public places, just planted by the government, but everywhere, cared for by the people who live with them. 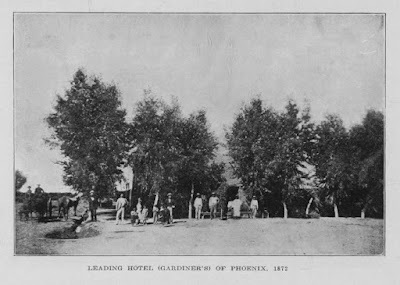 Image at the top of this post: The Gardiner's Hotel in 1872, northwest corner of Washington and 3rd Street, Phoenix, Arizona. Behind the trees.